My flowering cherry tree is a great inspiration to me, especially when I photograph its blooming period. Of course, that is only in the spring, but I appreciate every minute it stays bloomed! I added this quotation to one of my photos. 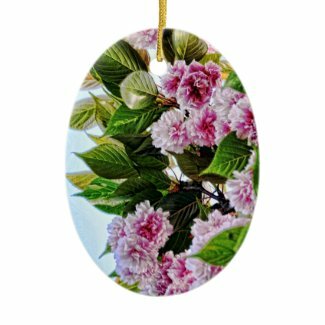 You can change the quotation, or not have it at all if you would like, at my Garden Glo Flower Art Zazzle Store by LorrieM. The light reflects in the background of this rose garden. This beautiful rose is particularly striking with its vibrant pink color. I’ve always liked violets. While visiting my sister, I took this shot of these lovely violets next to an old blue milk can. In the photograph, the purple color really pops out at you. I made a frosted glass border around the inside edges of the photograph to contain the still life scene.